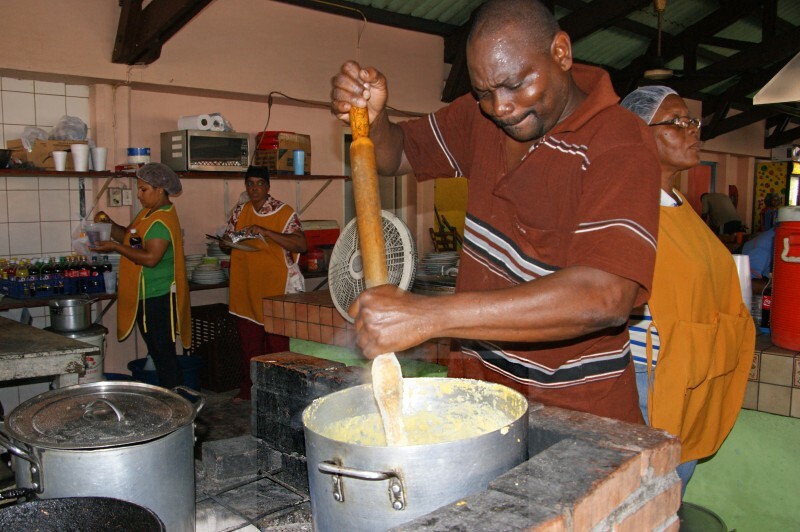 Where to find authentic krioyo soul cooking in Curaçao? 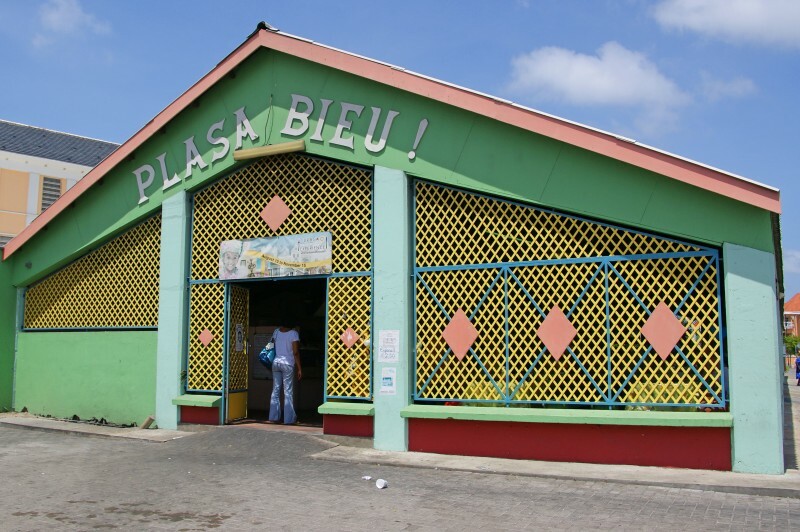 Look no further than Plasa Bieu, Punda’s Cafeteria (also known as Marshé Bieu; Old Market). 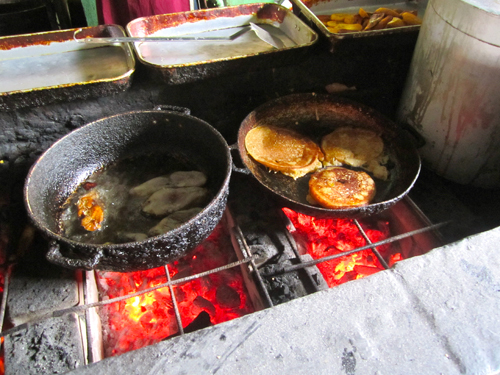 In fact, in a recent survey among this website’s Facebook fans Plasa Bieu won ‘Best Meal Under $10’. The eggshell blue building is open air and its interior is lined with communal picnic tables. 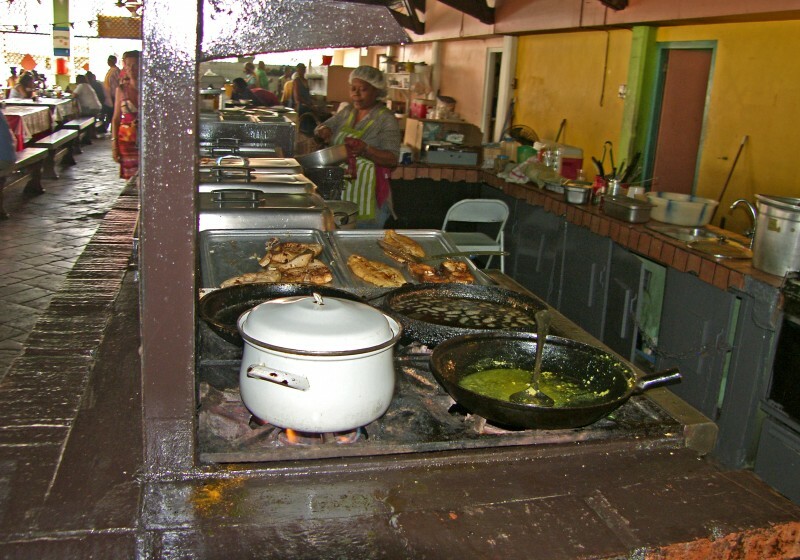 Charcoal grill stalls represent six different ‘restaurants’, enormous stew pots are prominently displayed and ‘local Mamas’ (as Food / Travel blogger David Rosengarten refers to them in his The Real Deal Meal in Curaçao) man each stall. The Mamas in front of ‘Zus di Plaza’s stall. 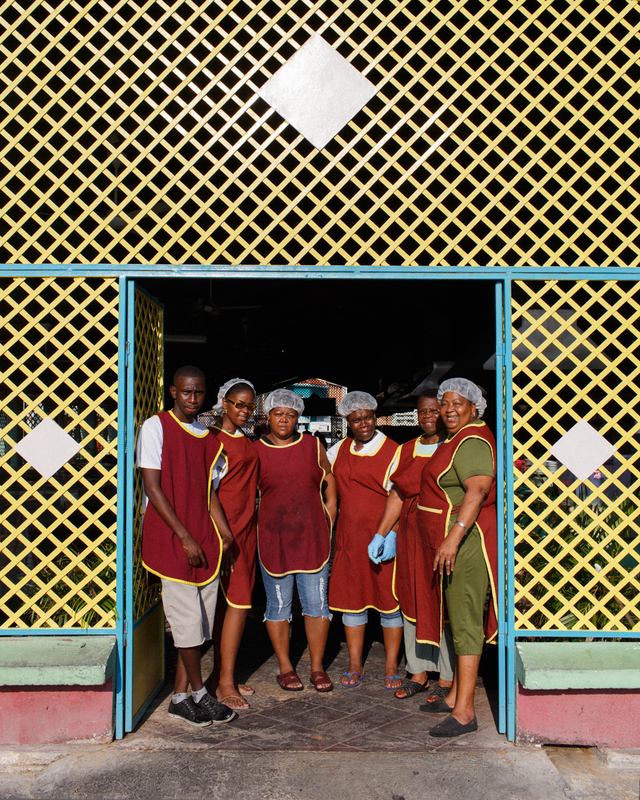 This cafeteria gets packed with locals for lunch, so get there between 11:30 am – 2 pm, otherwise you might be SOL. 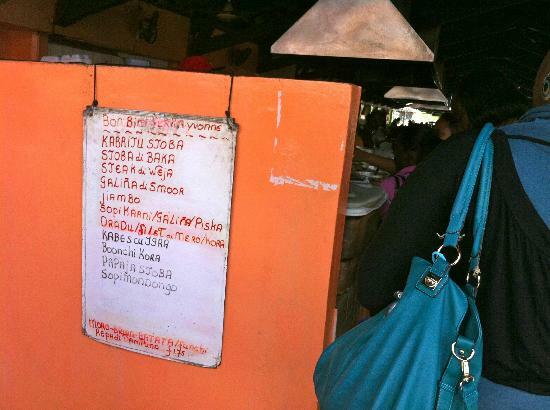 Menus are hand-scrawled on a piece of cardboard in Papiamentu. Rosengarten recommends ordering from Yvonne’s stall, he writes: “some of the favorite dishes are kabritu (stewed goat in a slightly sweet brown sauce)… stoba (various stews), karko (conch, thinly sliced usually cooked in garlic and butter)… funchi (the ubiquitous accompaniment of cornmeal paste, like polenta), and tutu (which is beans and funchi combined). Damaris: papaya stobá ku tutu! Tamarah: don’t forget to buy some arepa di pampuna to ‘chis’ (snack on) afterwards Caroline agrees: arepa di pampuna from Zus, ta duuuuuuuuuuushi!!!! Mike orders the stoba di kabritu (goat stew), while Tatiana prefers sop’i mondongo (tripe soup). Tirzah enjoys kalbas, banana or papaya stobá (calabash, banana or papaya stew), ‘from Yvonne, of course’. Repi Pampuna in the making. Guiambo (Okra soup) in the making. 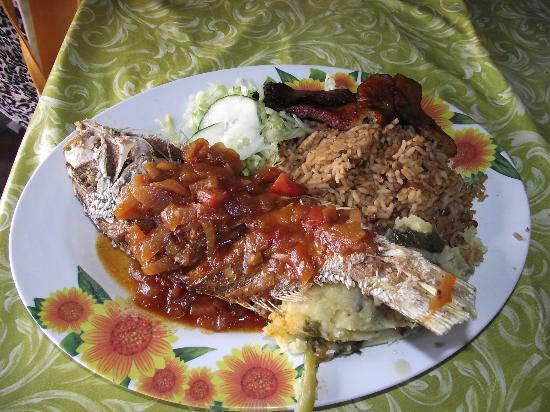 Red Snapper with hooopi sous krioyo. 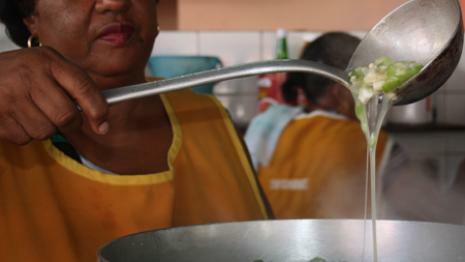 So there you have it folks: The Real Deal Food Magic in Curaçao. At the Grasia di Dios stall.